Our staff has been hard at work pulling together the best in stacked and stackable washer dryers for the 2017/2018 buying season. We’ve landed on the following 8 machines (rated in order) as being the best available machines online. We’ve also included detailed breakdowns of each individual unit in the linked sections below (see links in table). 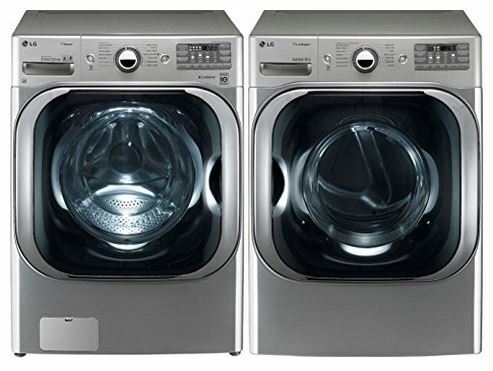 Another very strong option for your household this year is the Electrolux ELFS and EFME model washer and dryer. 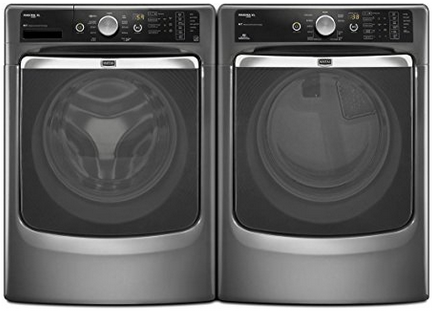 This purely electric dryer is the second largest of our test group, with 8.0 cubic feet of capacity. It is capable of handing a kind sized comforter on its own, with no issues. It’s gotten extremely high reviews from users, and is presented at a competitive price point. All these factors make it stand out from the rest of the crowd and push it toward the top of our list. 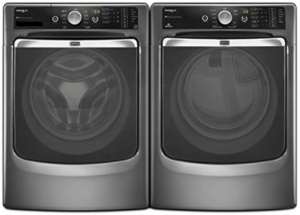 It will make a great addition to your home and can support a large household with frequent large laundry loads. Be sure to check for necessary power cords that might not be included in your order. When measuring for dimensions, keep in mind additional space necessary for tubes, vents and power cords. Adults might remember fondly the old Maytag repairman commercials. That certainly was a successful ad campaign, spanning generations, so our staff was glad to see the Maytag brand make an appearance on our list. From the extensive research we’ve done into customer feedback, it seems like the reliability that has come to be attached to the Maytag name is appropriate, as we’ve seen virtually no complaints of any type of mechanical and electrical issue. The large capacity makes this choice a good one for a moderately sized family with frequent large loads. While its purely an electric dryer, it can be powered via 120V or 240V, which is helpful for homes without the 220V outlets. Another item in our list from LG, and it’s deserved. 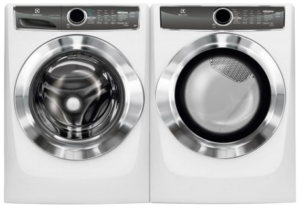 This relative newcomer to the consumer appliance space hasn’t wasted any time putting out some quality products and competing well against the big standards of GE and Maytag. The 4270 series model is a bit different our best buy of this year, the 8000 series we review above. The biggest difference from the 8000 series is in the capacity. That being said, a 4.5 cubic foot washer capacity combined with 7.4 cubic foot dryer is still bigger than most of our final list. With near flawless reviews from customers across the board, the only reason these units aren’t higher on the list is that they have a sister series that out pegs them on a few features and functions. That being said, the price is very competitive for this, so check out both before decided on which to go for. Like most all separate stackable units, you will need to purchase a stacking kit. The specific stacking kit for this model is Item No. KSTK1. 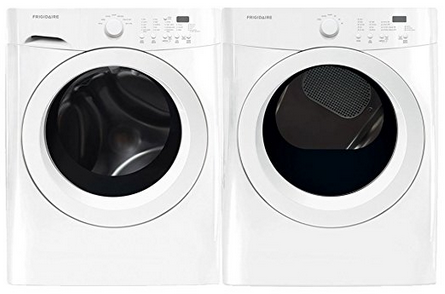 Our first entry from Frigidaire, these electric washer/dryers are a good choice for a small to medium sized family, as the capacity is on a the lower side of our final list. The reviews are generally very good. There have been some reported issues with defective motherboards, but after being replaced, the units proceed to work well. I would double check your warranty depending on where you make your final purchase to insure that this issue is covered. 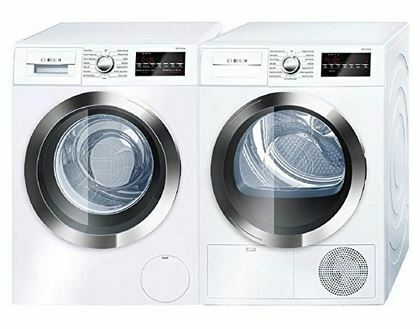 While technically classified as compact washer/dryers, these unit from Bosch are on the larger side of the compact class. It’s great for apartment dwellers, both due to its compact size, stackability, as well as not requiring vents or gas hookups of any kind. it runs of off electric, but does require a 240 volt outlet, which may not be present in every home. The high quality of these units is reflected in the price, which is generally a bit higher then comparable models. Check capacity and dimensions before ordering. This 24 inch unit is smaller then usual, but good for compact areas like apartments. Our second entry from Frigidaire is also our first fully stacked unit on our list. This stacked units are handy because no stacking kit is required, however they usually sacrifice a few things, namely capacity. Due to its smaller geometry, this is the smallest dryer unit on our list at 5.5 cubic feet. However, this is a perfect size for a couple of a single parent household who does loads once or twice a week. Many people prefer a smaller load capacity in exchange for the ease and convenience of a single stacked unit. It’s also got a competitive price point which can make up for some of the shortcomings when it comes to features. This single stacked unit does not require a stacking kit. This is was our best buy of the year, but unfortunately it is no longer available from Amazon and hard to find from other retailers. We will update when it is more widely available. With a combination of cavernous capacity (9 cubic feet of room in the dryer! 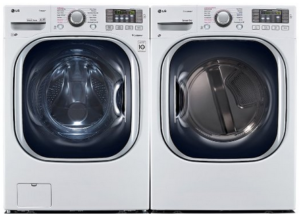 By far the biggest capacity washer/dryer we’ve seen this year), overwhelmingly positive feedback from previous customers, and a competitive price point, we think the LG WM8000 and DLEX 8000 makes the best opportunity for your home this year. 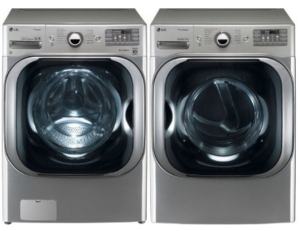 Additionally, the dryer can both use electric and gas, so it fits the needs of most any household. Like most all separate stackable units, you will need to purchase a stacking kit. The specific stacking kit for this model is Item No. KSTK2. Our final pick this year comes from a brand that has a stellar reputation for reliability, i.e. Speed Queen. Known for its entries into the commercial/laundromat market, this item is a residential stacked unit that will make a good fit in the right household. 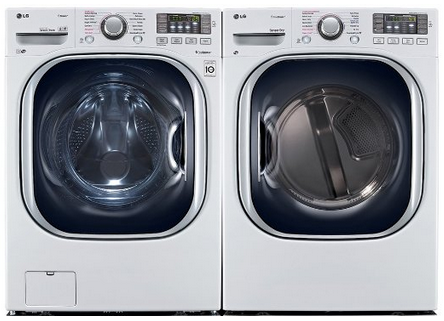 While its washer capacity is the lowest in our group, dryer capacity if far larger than our other stacked unit. It also got sent down a few pegs on our list do to the higher price point. While it may not be the best choice for the frugal household, the Speed Queen name and reputation might help you rest easier, knowing that future repairs and issues might be less of a concern. 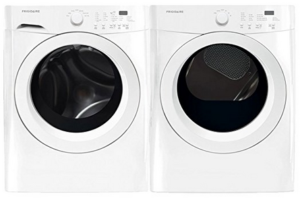 Just curious about something… Would you say there is a great deal of difference between your top 2 picks (LG WM8000 and the Electrolux ELFS617), I’m scoping out the prices and when I find a good one I will pick it up, but wanted your opinion before making a final decision. Thanks!